Friends and family ask us all the time why are you living in Chiang Mai, Thailand. So, we thought we’d further explain why we like this place enough to call it home for a few months this year. It may seem like a strange thing to hear, but once you have been here you’ll know what it means. There is a higher standard of living in Chiang Mai, there are lots of wealthy and highly educated Thai people that live here. There is just about any modern convenience you could need here. However, if you want the real Thailand just go a few blocks and you can find yourself in a bustling night market like anywhere else in Thailand. You can easily feel like you are at home here in Chiang Mai. We have everything that we are used to and at a very low cost of living. Without trying too hard we spend about 75% less than we would in the US. Chiang Mai is big enough to have everything you need but small enough to walk everywhere. On average, we budget ourselves $1,100 per month. This covers our rent, utilities, food, too many beers with friends, some regional travel, and everything else. We live comfortably for that amount and we could easily make some cutbacks to save more money, but that’s not really why we come here. We come here to live well for little money, the cost of living in Thailand is affordable all over Thailand. There’s a reason why a ton of ‘Digital Nomads’ call Chiang Mai home, the internet is very fast. We pay 899 Baht ($30) per month to have a dedicated Fiber Optic line that is 200mbps download, and 50 Mbps upload. There are lots of free wifi spots across the city and cafes with speeds around 2mbps and higher. It may not be important to some, but we rely on the internet quite a bit and it’s a big deal to us and anyone that works online. Of all the 75 countries we visited on this trip only two places have had better internet. Strangely, Ho Chi Minh, Vietnam, and Riga, Latvia have had better internet speeds. Also, cell phone service is very cheap and fast data, for 399 Baht ($12) we have unlimited data at fast speeds. Of all the places we have traveled, Chiang Mai just feels incredibly safe in every sense. I don’t feel like I am going to get hit by a motorbike crossing the street like most of SE Asia. I have no problem with Hannah going across town by herself, even after bar close there just nothing bad going on. This surely can’t be said for most of the rest of the world. We often work on our computers at the coffee shops around town and people will just leave their computers at a table while they go across the street. No one even thinks twice about it, and nothing happens, no one steals the computers. Maybe traveling has made us too paranoid, but Chiang Mai is just different. Feeling safe is key, it lets us spend some much needed time not right next to each other like we have for the last 500 or so days straight. There are people from everywhere in the world and everybody is here for the same reasons, and most people are very like-minded. There are so many interesting and creative people that make Chiang Mai their second home that it makes it a very diverse city. In the few months we have been here we have had beers with people from 30 different countries or more. Many people get sucked into Chiang Mai and stay for a lot longer than they planned for all the reasons above. Time passes strangely fast here. It often comes up while talking to other people staying in Chiang Mai long term how easy it is to live here and how fast the time goes. Chiang Mai is good, but it’s not perfect. Some of the same things that make it so good also take away from the experience too. Sometimes it’s too easy, too much like home (a warmer home). A few other low spots for Chiang Mai is the pollution. Still light years better than Bangkok, but the emissions regulations in Thailand are very low and even the moderate amount of traffic that Chiang Mai sees makes hard to breathe near traffic. There is always a construction project and businesses are quickly whipping up condos, bars, and restaurants that all kinda look-a-like and very cheaply made. Most places in the city are very new and lack character. When you weigh it out, the positive far outweighs the bad, and that’s what makes Chiang Mai a great place to base ourselves. So, that’s why we are back in Chiang Mai until the end of April before heading back to Africa in May. We just wrapped up our second 6-month stay in Chiang Mai, Thailand. We have been to countless restaurants, cafes, and bars. We searched high and low for the best hair salon, gym, massage, and much more. Now that our time is up we have narrowed down the best of Chiang Mai. We’re sad to leave, but looking forward to coming back to visit the best of Chiang Mai again in the future. Best Co-Working Space in Chiang Mai: C.A.M.P. Why I love it: The best Wi-Fi in Chiang Mai. CAMP gives 2 hours vouchers for free Wi-Fi with every 50 baht purchase. Other option to purchase AIS Wi-Fi hotspot, go to the 3rd floor in the mall to purchase or add it to your current data package. For only 19 baht week or 69 baht month, you get unlimited access to all of AIS hotspots around Thailand. There conveniently is one at CAMP, several days a week we will go to CAMP and just purchase a soda or two and work for 8-10 hours a day. Since it is located in the mail you have a food court in the basement, KFC on the 4th floor, and many more food options. TIP: Get there before noon or after 7 pm it gets really packed, sometimes hard to find a seat. It is huge, with many outlets, but it can be difficult to find a seat with enough elbow room and working outlet. Best things on the menu pad see ew with pork and 2 extra fried eggs which will set you back 95 baht ($3). TIP: If you go after 6 pm they reduce prices on produce, ready to eat food, dairy, and meats. You will notice they place bright orange stickers on the package, it may appear it this is the sale price, BUT this is the discount amount. So if the orange sticker says 10 baht then it is 10 baht off the original price. Best items are veggies and fruit. Why I love it: I have been going to the same hairdresser named Milk at New York New York for over a year now. I have had my highlights touched up three times now, it’s always exactly what I want. It’s hard to find a good western hair stylist in Asia. The prices may seem high for Asia, but New York New York is an Aveda salon and I believe you get what you pay for. Click here to see more on my visit to New York New York. TIP: Email to make an appointment in advance, the email address is [email protected] I have been going to the stylist Milk for over a year, and my friends go to Vera (owner) highly recommend both. Why I love it: We basically have the gym to ourselves 8am-11am, all equipment is new, free Wi-Fi that we are able to stream TV shows while working out. Best’s is the cleanest gym ever been to, the cleaning lady is on top of everything. There is equipment for both of us and more than enough free weights for Adam. TIP: Avoid working out after 4 pm, that is when all the college kids come. Bring your own lock for lockers. UPDATE: When living in Chiang Mai in 2016-2017 we joined Maxx Fitness in the Maya Shopping Mall on the 5th floor. It’s brand new, has an awesome location, great machines, not busy at all during the day BUT it’s expensive. We paid 2,700 baht ($75) a month…try and negotiate a good deal with them. Next time we return to Chiang Mai we probably will be going back to Maxx Fitness. Why I love it: The best prices in town, just go inside the liquor store and grab your beverage of choice. Sit down on one of the many plastic chairs & tables they set up nightly out front. It’s always crowded with expats and travelers in town, and usually a good time. TIP: Grab some street food from the vendors and bring it back to your table. I recommend the kebab guy for 50 baht right around the corner. Why I love it: Best burger in Chiang Mai, hands down! Real quality meat topped off with bacon, caramelized onions, and cheese! I suggest you get a double-double and thank me later. The guys that run the beast truck know what they are doing, if the quality of buns/meat is not up to par, they will not open for the day. They have high standards and their product is top notch. Why I love it: Our go-to restaurant in Chiang Mai, it was less than 5 min walk from our condo and revisited weekly. It’s nice to find a healthy organic restaurant in Asia. If you are a vegetarian in Chiang Mai you must come to Food 4 Thought. TIP: I would always order the Chicken Caesar salad which had real bacon, parmesan cheese, croutons, sprouts, tomatoes, cucumbers, olives, and Caesar dressing. Adam went for the wasabi chickpea wrap with chicken. They have tons of salads, wraps, bagels, sandwich options on the menu. Never had anything we didn’t like. Say hi to Charles, Bay, Foxy the cat, and the kittens. Why I love it: Best food in Chiang Mai for the price hands down. Huge portions, cheap prices, and tasty! If you are in the moat check out The Cat House, you won’t be disappointed. TIP: Get the burrito with chicken, loaded with chicken and comes with a side salad with the best passion fruit dressing! Check out these Chiang Mai food options in the Old City. Why I love it: I have nicknamed the owner Ninja. She has some of the sharpest elbows known to man, but she knows what to do with them. If you are looking for a good Thai massage, Sala massage is the best in the Nimman area and at only 180 baht an hour. TIP: Splurge and get an hour Thai and hour foot massage, totally worth it. There are several festivals and public holidays celebrated in Chiang Mai. The best one is the Songkran festival celebrated every year April 13-15th where the world’s largest squirt fight helps wash away people sins. This way they start the Thai New Year pure and fresh. The Yi Peng lantern festival happens in October/November every year. This is where thousands of floating lanterns are set to the sky as people celebrate the Yi Peng festival. Our 5 months in Chiang Mai has come to an end. Seems like just yesterday we signed the lease to our apartment. We used Chiang Mai as a base to catch up on the website, and still be able to travel affordably. Over the 5 months, we have met so many amazing travel bloggers and even made a few good friends. We ended up getting a Sak Yant tattoo so that we will always remember our time in Chiang Mai. Until next time Chiang Mai. Have you visited or live in Chiang Mai and have some recommendations that should be included in the “Best of Chiang Mai”, if so just leave them in the comments below. Sometimes we set an alarm clock, but we’d rather leave the shades open and let the sun shake us from our sleep. We typically get up between 7-8 a.m. every day even on weekends. Adam makes himself coffee, has some oatmeal, and we check our emails before we out the door. We try to get out the door by 8:15 a.m. our gym is a short walk away (1km). Many people in Chiang Mai have a motorbike, but we’d rather walk everywhere. It’s our time to talk about what we are doing today, and it gets our bodies warmed up for the gym. Every morning we stop at 7-11 where Adam gets a red bull, at $0.30 a pop. We like to get the gym bright and early as the temperature outside is pleasant under 75, if we waited until after lunch we would be looking at 90+ and into 100+ come March. We work out 5-6 days a week, working out was one of the biggest things we and our bodies missed. Being on the road nonstop we never got a proper workout. I love being able to wear all my fun prAna workout clothes, I think when you have cute stylish workout clothes you workout harder and are more likely to get to the gym The gym is also nice and dead right away in the morning. This is also my time to catch up on my trashy reality TV. On our way back home to our apartment and maybe pick up some bananas or papaya at the small market we walk past. Most days we get back to shower up, blend up a protein shake for Adam and passion fruit smoothie for me, maybe throw in some laundry, check emails again & plan out what needs to get done today and make salads for lunch. Having a kitchen was a must for us, we are happy not to have to eat out 3x a day 7 days a week. We typically have lunch or dinner at home every day. Some days we will head down to the pool or up to the roof and layout in the sun for an hour after the gym, trying to keep our tan from Koh Lipe. On average we are at the cafe 8-10 hours a day. Typically we go to the mall Maya that is less than a 5-minute walk from our apartment. There is a cafe called Camp that is open 24 hours a day, has great wifi, cheap drinks & food, outlets everywhere, cold A/C, outdoor seating, huge, and a great place to meet other travel bloggers in Chiang Mai & other nomads. Here we can buy a coke for $0.60, onion rings $1.75, Pad See Eww with pork $2, and they have a full menu of other drinks & food. We typically spend $7 a day here for dinner and sodas for a 9-10 hour shift. There is also a KFC one floor down where they have chocolate dipped ice cream cones for $0.50 which we frequent daily. We like to both be at Camp but not have to be sitting on top of each other, we need our time apart. We spend our time writing blog posts, editing photos, writing freelance assignments, responding to comments on the blog, planning our upcoming trips, updating the website, and so much more that goes on with running a website. We too often come home and reset up our computers. As it is 10 a.m. at home we probably got an email or something we need to deal with before bed. We try to have our Facebook post ready for morning and night, but often we don’t so we are scrambling last minute for a status update. We try to unwind and turn our brains off while watching a TV show on Hulu/Netflix. We just finished Breaking Bad, looking for a new series to start. Then it’s off to bed, we turn on the white noise app as the bar next door is usually still going and we can’t fail asleep without the app. A few days a week we try and leave the cafe by 6 p.m. and go out for dinner & drinks with friends. We have made several friends here, it’s not too hard to talk someone into meeting you at the liquor store for a beer. Yes, we drink at the liquor store, there are chairs & tables set out in front of the liquor store. It’s the cheapest place in town for a drink. We have our handful of favorite restaurants in town, and thankfully our friends love them too. We end out at dinner with Brittany & Charlie from The Trading Travelers at least 1-2 times a week. Usually one beer at the liquor store, and then to a real bar for a few more. If we have had too much to drink there is no drunk pizza shops for a slice, we usually end up at 7-11 for a toasty sandwich or one of the tasty street vendors for a tasty bowl of khao soi or maybe a chicken kebab. I get my nails done every 3-4 weeks, I decided to get gel nails back on. I think my fingers type fast when they are pretty. Also talked my friend Brittany into getting a pedicure once a month with me, but for only $10 we get a full spa pedicure, it’s a great deal if you ask me. Adam and I only get one maybe two massages a month, and we should get more. An hourThaii or foot massage is only $4, we should really take advantage of this while we are here. We have also taken off a few days from working completely. When we heard there were cherry blossoms in the Hmong village just up the mountain we got a few other friends to come with and split the taxi cost with us. We couldn’t believe how gorgeous it was when we were up there. I couldn’t have planned a better day or a better outfit. On Christmas, we went up to Doi Suthep with a few other travel bloggers to catch the sunrise. Great Christmas morning! We beat the crowds of tourist, got the perfect stairway shot. Unfortunately, on this day we did end up going “to work” aka the cafe in the afternoon. So there you have a typical day as a travel blogger in Chiang Mai. We do not sleep all day…happy hour is not a daily occurrence…and we don’t party all night every night! If you ask me we kind of have a normal life, it’s just that we are living in Thailand and we are working 2nd shift. We booked a two week trip to thailand in march. The last lag of our trip we will be spending in Chiang Mai ( March 26th-30th). I have recently came across many posts on the internet about the burning season. This has me a little worried. Do you suggest we spend the last lag of our trip else where? We were looking forward to the elephant sanctuary. March is burning season, every year is a little bit different, and some days are worse than others. I personally wouldn’t avoid visiting the city just because of that unless you have health problems specifically respiratory issues. We find it more of a nuisance than anything. Sounds a bit like why I moved to Taipei. It was almost entirely an economic decision. Wish I had the Thai food you have though. And let’s not forget: the bars close at midnight. I’ve found many volunteer opportunities at workaway.info, and would like to find out how the government restricts long-term volunteering (could you provide a link? ), that is, for how many months or years and any restrictions. Thank you for your time. They will be able to answer your questions accurately. Does Thailand require foreigners to have health insurance? Are there many basic employment opportunities foreigners can find? There is no requirement for health insurance for visitors to Thailand. Travel/health insurance is always good to have, but if you’re tight on budget the medical care in Thailand is very affordable and high quality in the big cities. I can’t advise you to take or not take insurance, but I hope this helps a bit. As for work, working is not permitted without special visas which can be difficult to get. Many people work under the table offering English lessons or working at hotels & bars but it’s not legal and you could get into trouhttps://www.gettingstamped.com/wp-admin/edit-comments.php#comments-formble. Is working on your blog as a business conside red a visa requirement? Can you recommend any good places to stay for just a few short days….primarily good in location. Also a recommendation of the top 3 or 4 things to see/do in Chiang Mai….and top 3 or 4 places to eat?? Thanks so much! First decide if you want to be by Nimman or Old City. We have never stayed in a hotel so can’t suggest any in particular. For sure I would eat at: Food 4 Thought (7 min walk from Nimman), The Cat House (block outside walled city), Beast Burger Truck (nimman), and honestly Tops supermarket food court has tasty cheap Thai food! To do: hit up loads of coffee shops around Nimman, Doi Suthep, Ladyboy show in the night market is fun and only $5, Sat/Sun night market, massages, massages, and more massages! Great post. I agree with all your points. After travelling steady for almost 3 months, I decided to settle down for a bit in Chiang Mai. I love it here. It’s got a good balance of everything that you need. It’s very relaxed. Perhaps too relaxed, as I find it hard to have any discipline and a get anything done. I shouldn’t complain…I love the place. hi , chiang mai is my favorite Place in Thailand. Its big enough but not polluted as in Bangkok but you have all convenience and the nightlife is amazing. I love the redcars and the many temples and live music. It’s really a must see if you are in Thailand and not for a day or two, rather for some weeks. Have you guys been to a Muay Thai Fight? Oh I so agree with you, thanks for a great post! Chiang Mai feels like home! I’ve been here 2 months now with my boyfriend and we are so sad to leave the city. We lived 4 months in Phuket last year and I was ready to go back home after 2,5 months… But CM is so different and like you said it’s not Thailand, especially when living in Nimman. I did a complete 180 on Chiang Mai! I couldn’t fiigure out why people liked this place so much. I thought it was bland and had no atomsphere. But then I gave it some time and came in contact with some cool people. If you haven’t already I would be interested in reading a thorough account of how you went about finding an apartment to rent. I’m considering renting apartment there within the next month or so. Where do you find apartments that are available to rent? How did you decide what area to rent in? What can you expect per month for what you pay? I would be interested to read an article that covered these topics. Have heard nothing but good things about Chang Mai. My only concern would be I get there and it’s full of foreigners. There are a good amount of foreigners and tourists, but the tourists mainly are in the moat and foreigners are spread out. We really like having our expat friends, and western amenities here. I left Chiang Mai after 3 days to go up to Pai. I only spent 2 nights in Pai before turning around again! I missed Chiang Mai so much. It was instant love for me. I can see why you love it so much! We haven’t made the trip up to Pai yet, did you like it? Chiang Mai is our new home and we love it! YOu had me at “the internet is great” 😀 That’s all I need to satisfy me that a place is great to live in lol!! LOL yes solid internet, that is all you really need to survive! Chiang Mai is fairly high on our ‘places we could live list’ it’s easy to see why the expat community is so large there. For me it was the perfect blend of Western convenience but with all of the fantastic things that Thailand has to offer, glad to hear you’re enjoying your time there. See you know exactly what I am talking about! We are loving life here. Since you’re living in Chiang Mai, where are you going to make your customary beach visits? I associate you two with the beach (especially, Hannah) so I certainly hope you continue to enjoy sun and sand. That said, Chiang Mai certainly seems like a great place. I can’t say I’ve spent too much time there but the last time I was in Thailand, I visited the city and had a great time. 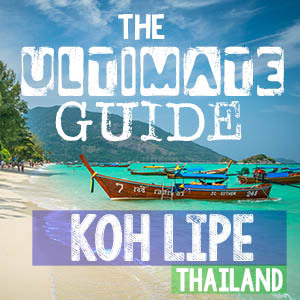 Well we just went to Koh Lipe, which is our favorite island in the world. Yes I love the beach, I do still layout at the pool at our apartment to make up on lost beach time! Just from visiting Chiang Mai for a few days, these reasons totally make sense. Seems like a great place to call “home” as a traveler/blogger! (BTW- I’m headed to Riga this May so I’m going to have to hit y’all up for some tips)! Yeah Karisa Chiang Mai is great. How long you planning on going to Riga? Lovely little town, I can have my cousin show you around too! Katie is the best place for us right now. I wish there was a sea nearby…but you can’t have everything I guess!